Once again Manny "Pacman" Pacquiao has proven that he is "The World's Pound for Pound King" in the field of boxing. It was on the 12th round when referee Kenny Bayless stopped the fight to save Miguel Cotto from further injury. 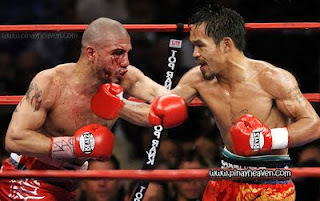 Although Cotto was able to sustain the attacks of Pacquiao, he had some 2 to 3 slippage due to hard punches thrown by the latter. It was really a heart pounding moment as we watch the fight specially when the fight passed the 6th and 9th round where Pacman usually delivers the finishing knockout moment. 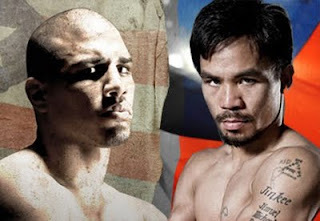 On the 11th round Cotto's camp is already planning to "throw the towel" but decided to continue for the last round. 55 seconds before the 12th round ends, Pacman delivered a series of rapid punches that the referee decided to stop the fight to prevent further injury to Cotto.